Holding fast to a philosophy that puts product and users above all, programmer-developer Justin Frankel used his own love of music and recording to a company that produces tools for others whose passion for audio run as deep as his own. Having made a fortune selling his first company, Nullsoft, to AOL and creating a file-sharing program that put arguably greater power into the hands of music consumers than Napster, the man Rolling Stone Magazine once dubbed “The World’s Most Dangerous Geek,” Frankel has now settled into a quieter form of disruption. 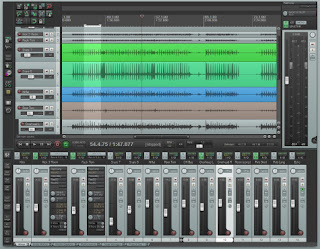 His current company, Cockos Inc., founded in 2004, bore Reaper—a multi-track audio recording workstation for Windows and OS X. Frankel’s biggest competitors in the space – ProTools, Reason, Logic and Cubase – can retail for about $300 or more. Reaper’s license fee for amateur users or companies making under $20,000 gross revenue lists at the somewhat disruptive price of $60. “I think our presence in the market has driven prices down because I think a lot of people realized that things were being overpriced,” says Frankel. Other players offering cheaper recording solutions have also had an effect, he says, pointing to Apple Inc.’s acquisition of Logic and its subsequent markdown in price. Frankel is best known as the creator of Winamp, a media player he designed when he was 18 for listening to music, which he sold to AOL in 1999 – along with his company, Nullsoft – earning himself about $59 million in the $100 million deal. He stayed on with AOL to develop the product. Ever innovating, Frankel made waves with AOL when he released Gnutella in 2000, a song-sharing program similar to Napster but with no angle for monetization and no central traffic hub, so it could never be shut down—essentially disrupting a disruptor. Once downloaded by other developers, Gnutella spawned other such music-swapping platforms that made Napster’s eventual takedown largely irrelevant. AOL, then in negotiation to merge with Time Warner (whose music group was in the process of suing Napster as part of the Recording Industry Association of America) got a little uptight about the whole situation, creating an abrasive relationship between the young developer and his parent company. Frankel announced his departure from AOL in 2004. He released Reaper to the public in 2006, funded by his sale of Nullsoft. Profitability arrived in 2007. Reaper's audio recording workstation sells for a price disruptively lower than competitors and makes a profit without advertising or marketing support. Those familiar with the multi-track computer recording space will understand that paying for a digital workstation is one thing, buying the plugins (or add-on programs) that allow users to add new functions is another, and can be quite pricey. Reaper comes with ten plugins, like a compressor, a noise gate, EQs, pitch-shifting and delays, etc. And there will likely be no advertising or marketing campaign. “People will tell their friends about Reaper when they fall in love with it.” Chances are Cockos also won’t make a play anytime soon to send its user base (which is a mystery even to the company) into overdrive. Profitability is there and, as long as Reaper continues to improve and consumers continue to download the workstation, Frankel sees no need to bend over backwards to accelerate growth.